Earth's global albedo, or reflectance, is a critical component of the global climate as this parameter, together with the solar constant, determines the amount of energy coming to Earth. Probably because of the lack of reliable data, traditionally the Earth's albedo has been considered to be roughly constant, or studied theoretically as a feedback mechanism in response to a change in climate. 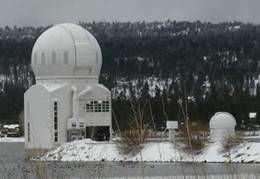 Recently, however, several studies have shown large decadal variability in the Earth�s reflectance. Variations in terrestrial reflectance derive primarily from changes in cloud amount, thickness and location, all of which seem to have changed over decadal and longer scales. Figure 1. Earthshine dome in BBSO to the right of the NST dome. The project is led in BBSO by Prof. Phil Goode and in the Canary Islands by Dr. Enric Palle. Some recent results (JGR, 2008, in press) combining earthshine results with satellite results shown in Figure 3 reveal a consistency among earthshine and satellite results. Earthshine results will improve in precision and coverage with the remotely operated station in the Canaries. Two stations give a global coverage. 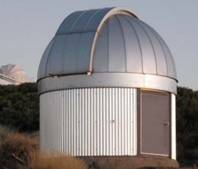 The project also has intermittent ongoing earthshine data from the Crimean Astrophysical Observatory using a calibrated telescope that requires an observer. Figure 3. 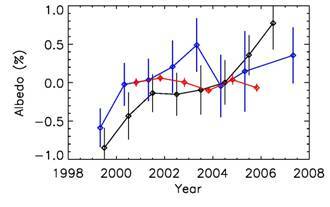 Earthshine changes in albedo shown in blue, ISCCP-FD shown in black and CERES in red. A climatologically significant change before CERES followed by a long period of insignificant change. The Project Earthshine Bibliography can be seen here. Some other details of Project Earthshine can be found here.